SOCIAL SPACES ARE BOTH IMPRESSIVE AND WELCOMING, PROVIDING THE PERFECT PLACE FOR PLANNED GATHERINGS, CHANCE MEETINGS OR QUIET INTROSPECTION. The Reserve presents its residents with a generous array of impeccably realized social spaces. Neighbors and friends will socialize, relax and exercise in tasteful, contemporary spaces designed to complement their own homes in the tower above. Residents will also enjoy enhanced personal services including a full-time butler, valet attendants, a wellness club for the pursuit of healthy living, a dedicated Rolls-Royce house car for local outings, and so much more. THE OPULENCE DISPLAYED IN THE INTERIOR SOCIAL SPACES IS RIVALED BY THE GRANDEUR YOU WILL FIND THROUGHOUT THE OUTDOOR AMENITIES. 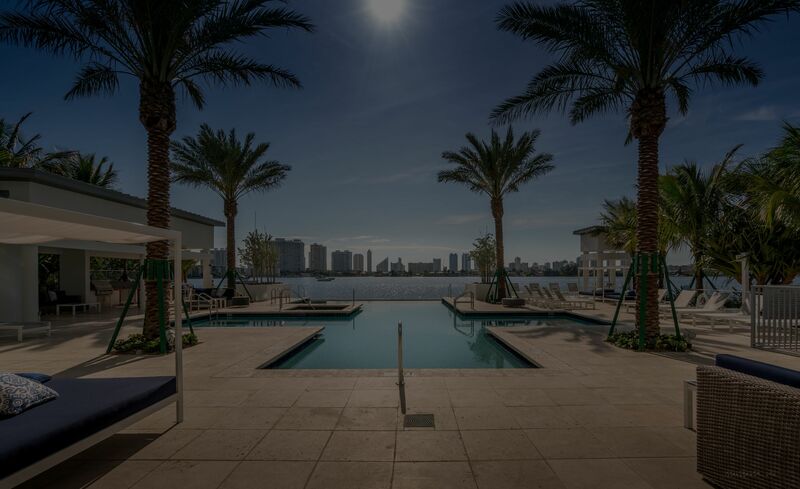 The Reserve’s generous setting results in a nearly half-acre, resort-style pool deck with a stunning waterfront swimming pool, a sunrise yoga deck at the water’s edge, and an elaborate, rodizio-inspired grilling terrace for al fresco feasts with a view. Meanwhile, the action-packed Kids’ Play Zone and Saturday morning Kids’ Club give younger residents plenty to do without encroaching on the relaxing, beach club vibe around the pool. Throughout the grounds, discover specialized gardens–one for chefs, another for butterfly enthusiasts–along with a dog-walking trail and the Nature Lounge, an idyllic spot for simply enjoying the scenery. SERVICE AND LUXURY ENRICH YOUR EVERY MOMENT, BOTH ASHORE AND ONBOARD. Home to the area’s first new, private marina in over 20 years, The Reserve offers its residents countless ways to experience life on the water. From jetskiing and waterskiing to kayaking, windsurfing and paddleboarding, to organized dive trips, fishing excursions and more, if it can be done in the water or on the water, it can be arranged through the Yacht Club Concierge.Residents who opt for a full Boat Club membership also enjoy access to the club’s own fleet of boats, ranging from 23 to 36 feet. Enjoy all the pleasures of boating without the responsibilities of boat ownership. FROM FINE FINISHES TO EXTRAVAGANT VIEWS, THE RESIDENCES AT THE RESERVE ENSURE A CONTEXT OF BEAUTY FOR DAILY LIVING. The residences at The Reserve offer a range of gracious two-, three- and four-bedroom layouts. Ceiling heights of over nine feet lend extra drama to the captivating water views, savored through the floor-to-ceiling windows and on generous, deep terraces with view-friendly glass railings.Your Reserve residence distinguishes itself at every turn. In your kitchen, it is Snaidero for the cabinetry, quartz for the countertops and appliances by Sub-Zero and Wolf. Baths are equally well-appointed with Snaidero floating vanities and fittings by Grohe.Throughout your home, elevated quality is at work all around you, in many ways you cannot see. The even swing of a solid-core door. The superior acoustics of enhanced soundproofing. The convenient integration of smart home technology. gracious two-, three- and four-bedroom layouts. deep terraces with view-friendly glass railings. vanities and fittings by Grohe. convenient integration of smart home technology.